John William Helman joined the Royal Navy in June 1914 at the age of 18, enlisting for 12 years, although his service records indicate that he served as a boy before then. 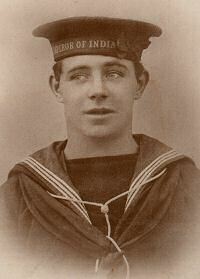 After on-shore training and service at sea he volunteered for training on HMS Hindustan at Chatham for a secret mission. He then transferred to HMS Daffodil which took part in the April 1918 raid on Zeebrugge. Daffodil was a converted Mersey Ferry used to transport Royal Marines on that raid. Reports from the time say that he suffered from exposure and/or "gassing" during this raid. 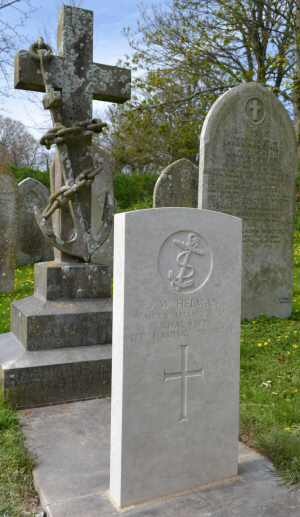 He died in Castel, Guernsey in 1920 and his death certificate stated that he was still a serving sailor. The cause of death was given as pulmonary phthisis. 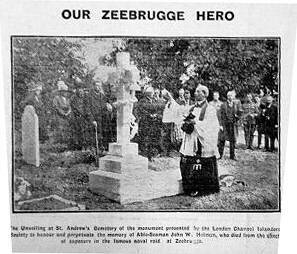 A local newspaper article shows the unveiling of this memorial in 1921. It was presented by the London Channel Islanders Society. "If you can prove that John Helman's death was directly attributable to his military service, for instance if this is stated on his death certificate or in his service records, then we will submit a case of non-commemoration to the Ministry of Defence who decide on such matters"
We have copies of his service record from the Public Records Office, of his death certificate from the Greffe in Guernsey and of Admiralty reports mentioning his contribution of the Zeebrugge operation. 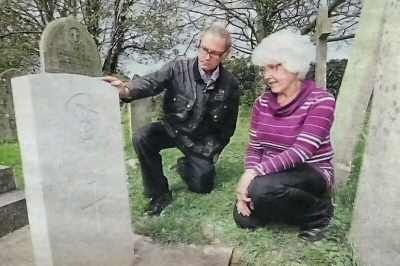 Details have been forwarded to the Admiralty, via the CWGC, and John William Helman has been accepted for official commemoration (October 2011).